Currently the Manila staging of Xanadu musical is being held in RCBC Plaza (If you want to watch go here) and sure enough the wacky musical will soon end tomorrow. But despite endings, Atlantis Productions has a already lined up the musicals that they will offer on the next months. Atlantis production just released the latest poster for the Stephen Sondheim's A Little Night Music that will eventually end the company's 2010 season. For a quick fact as I said, A Little Night Music is a masterpiece by the Award Winning Composer and Lyricist Stephen Sondheim well known for his works such as Into the Woods, West Side Story, Sweeney Todd and a lot more. The lead actress Desiree is set to be portrayed by the TV and Movie Actress Dawn Zulueta who received commendable praise from Singapore where the musical is first staged. 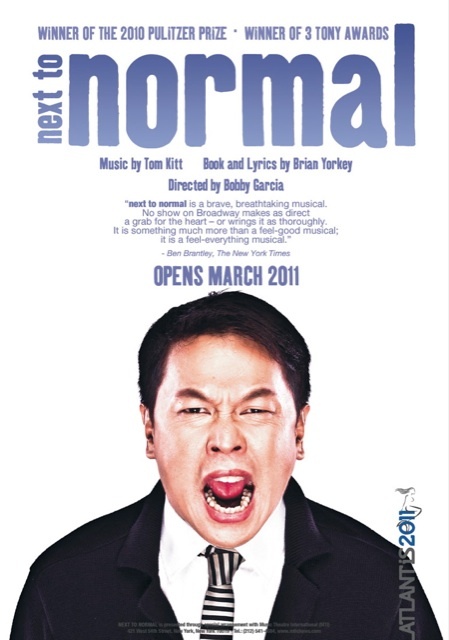 The Manila staging will be directed by Bobby Garcia who also directs the Singapore production. 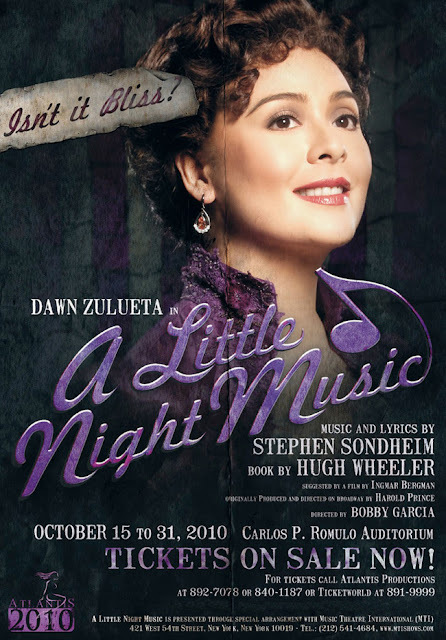 A little Night Music will premiere on October 15 - 31 in Carlos P. Romulo Auditorium. For tickets and schedules call Atlantis Productions at 892-7078 or Ticketworld at 891-9999. As the 2010 season ends, the 2011 starts. 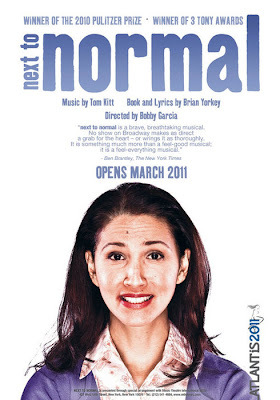 And next year, Atlantis production is bringing us Next to Normal announced to be top-billed by Menchu Lauchengco-Yulo (West Side Story, Hairspray) and Jet Pangan (Spring Awakening, Legally Blonde). Next to Normal is a rock musical with book and lyrics written by Brian Yorkey and music by Tom Kitt. Its story about a mother who struggles with worsening bipolar disorder and the effect that her illness has on her family. The musical also addresses such issues as grieving a loss, suicide, drug abuse, ethics in modern psychiatry, and suburban life. The musical was nominated for 11 2009 Tony Awards including the Tony Award for Best Musical and won three, Best Original Score for Tom Kitt (music) and Brian Yorkey (lyrics), Best Orchestration for Michael Starobin and Tom Kitt, and Best Performance by a Leading Actress in a Musical for Alice Ripley. It seems that Atlantis Productions has a lot to offer. We will keep you posted as soon as we get more information about the shows. A Little Night Music October 22, 8PM show now available!